I am pleased the IDEMA programme enables, VNG International and CILG to share our knowledge and experience of decentralisation and local governance with Tunisia. I really hope the programme contributes to a more accountable and inclusive governance and enables the Government of Tunisia’s a long-term decentralization process.” Pieter Jeroense, Tunis. In Tunisia, the implementation of a decentralization policy was a response to demands post January 2011. They called for more socio-spatial equity, dignity and democratization of local governance. They also denounced the social and economic injustice, as well as the imbalance between the regions. Thus, the Constitution of 27 January 2014 has made decentralization one of the cardinal principles on which the new territorial organization of the country is based. 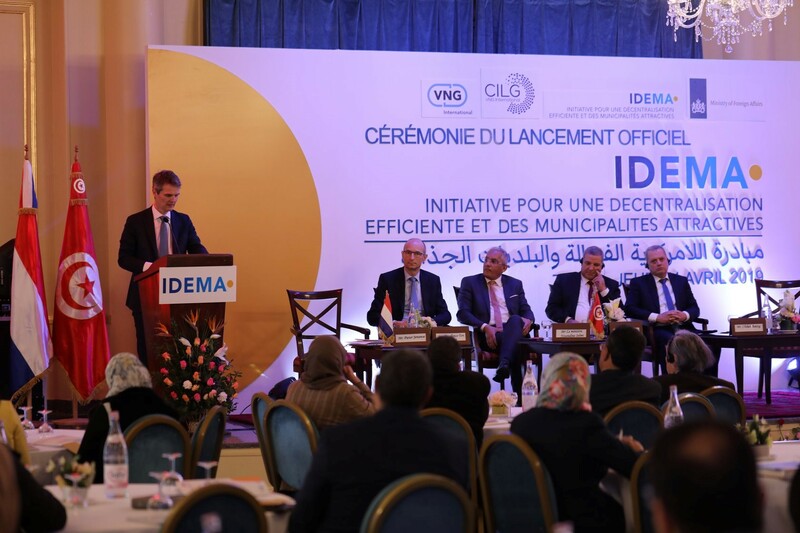 On April 11, 2019 the new IDEMA programme (Decentralization and Effective Municipalities Initiative) was launched in Tunis in the presence of senior Tunisian government officials, Ton Lansink, Ambassador of the Netherlands, national and international partners and the Deputy Managing Director of the VNG: Pieter Jeroense. The project runs until July 2022 and will target 12 municipalities: Douar Hicher, Raoued, Ain Drahem, Béja, El Krib, Thibar, Bir Hfay, Hessi Ferid, Benguerdanne, Dehiba, Boughrara and Jemna. Strengthening the key national actors in the decentralisation process: The Ministry of Local Affairs and Environment, The Ministry of Equipment to the municipalities and the Urban Planning Directorate as well as the Association of Tunisian Municipalities (FNVT). As decentralisation is a multiactors process and there is a risk of divergence and conflict between actors, the project aims at setting a functioning mechanism for constructive and social peace building multi-stakeholder dialogue. Technical assistance to the targeted municipalities to fulfil their role in leading Local Economic Development and providing municipal services of quality. The project aims to get a more rightsbased, more conflict sensitive approach to service delivery on the ground in the 12 target municipalities, while still looking at classical data on services’ coverage, accessibility, efficiency and quality. Two main competencies of municipalities will be considered: public spaces and waste management. These two competencies have an important impact on the living environment of citizens. A better living environment is not only a matter of services but should also include the way to improve local economic conditions and job creation, as an alternative for youth limiting illegal migration and reducing the risks of radicalisation. Throughout the programme promoting citizen participation in planning processes and inclusivity. The project aims at consolidating a social cohesion/social contract dynamic between citizens and local governments. This essentially aims to improve of the performance of municipal participatory and accountability frameworks – and with it especially the participation of women, youth and disenfranchised groups. This is based on the idea that both the ‘demand’ and the ‘supply’ of accountability need to be there for something meaningful to happen.